If you use any Google services—Gmail, Drive, Photos, Google+, etc.—then you undoubtedly have a Google Profile. When you set up your Gmail account, you included information about yourself, like your name, birthday, and even places you’ve lived. If you haven’t taken the necessary steps to ensure this information stays private, then it could be out there for the whole world to see. This information expands when you use more Google services. For example, if you use (or have ever used) Google+, then you likely have your work and personal emails, place of employment, places you’ve lived, and possibly even your phone number listed. Thankfully, it’s incredibly easy to adjust this information. 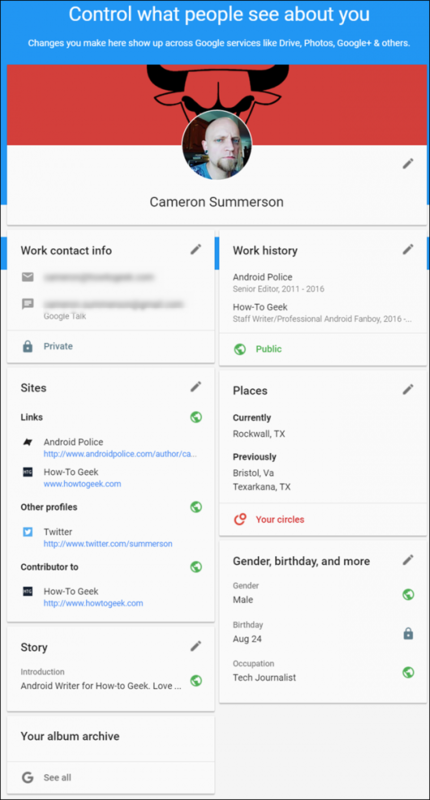 Google keeps your personal profile neatly tucked away in a simple About Me page. Once you head there, you can start to see what other people can see—and stop them from seeing it if you’d like. It starts with the simplest stuff first: your name. You can not only change your name here, but also add a nickname if you’d like, and select your display name—just click the little pencil icon on the right side to get started. As noted at the bottom of the page, it’s worth keeping in mind that if you change your name here, it will change throughout all Google products. So if you use your Gmail address for professional communications, it’s probably not the best idea to change your name to Namey McNameface. 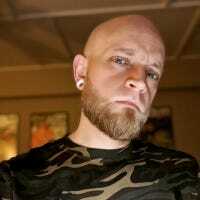 Below your name is where the meat and potatoes of your profile is found: contact info, work history, places you’ve lived, sites and other social networks, gender, birthday, and story. Pretty much all of these follow a common pattern when it comes to setting your privacy, making it simple to quickly go through and tweak. Public: Anyone can see this information. Good for anything you don’t mind everyone knowing. Private: This is totally hidden from anyone aside from you. 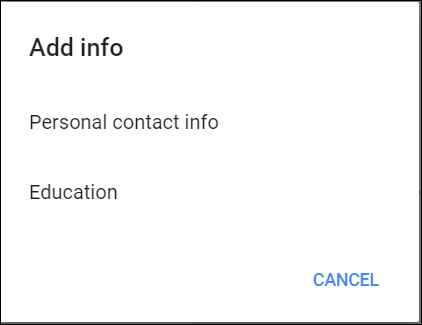 Use this setting for information you’d rather keep personal. 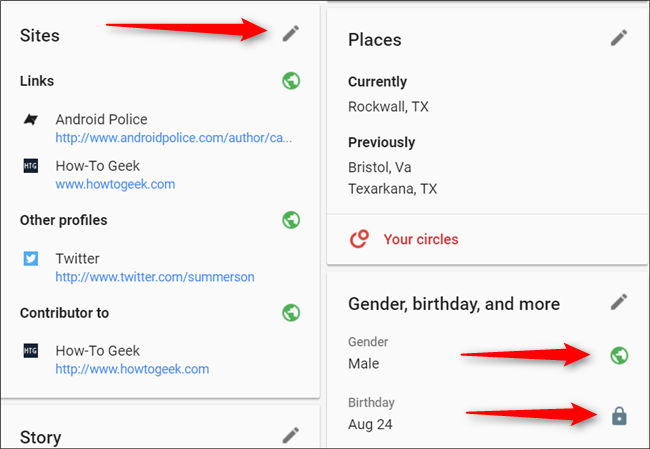 Your Circles: Anyone you’ve circled on Google+ will be able to see this info. 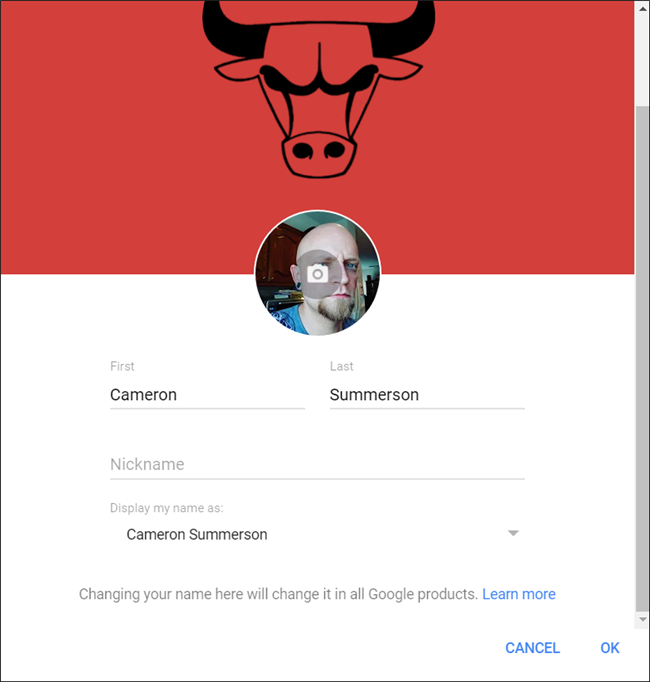 Use this if you use Google+ a lot and are particular about who you add to your circles. Extended Circles: This covers everyone in your circles and everyone in their circles—similar to “Friends of Friends” on Facebook. The reach is much broader here, but info is still hidden from some people. Custom: This is where you can be very specific about who can see this information by sharing it with specific circles. For example, you may not mind your Family or Work circles seeing your email address, but you may be less inclined to let your “Following” circle get this info. You can even share with specific contacts (instead of whole groups). It gets really granular, which is great. 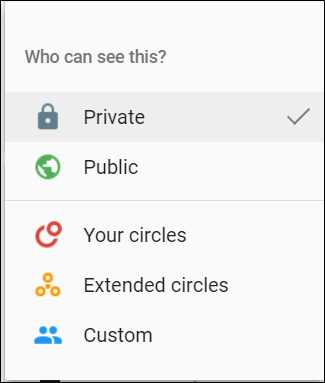 If you don’t use Google+ at all, then you probably won’t have any circles to share info with. In that case, you can either go black and white—public or private—or simply pick and choose which Google contacts you’re cool with sharing the info with. And that’s how this works across the board: click the pencil icon to edit the displayed information (or add to it), then click the privacy level indicator to modify the current viewing privileges. It’s worth noting that for most of these settings, the privacy level indicator is just an icon: a green globe means it’s public, while a lock icon means private. This isn’t just for looks, however—these are clickable! Many people may not realize that, as it’s easy to overlook. I can appreciate how granular these settings really are—nearly each individual entry can be set accordingly. For example, I don’t mind people seeing any links I provide, but I prefer to set the places I’ve lived only visible for those in my circles. And my birthday? Well, that’s private. I just can’t stand getting 100 “Happy Birthday!” messages from people I don’t even know. It’s just silly. Lastly, there are a couple of other things at the bottom of this profile worth talking about. First, there’s “Your Album Archive,” which may be a little confusing at first. 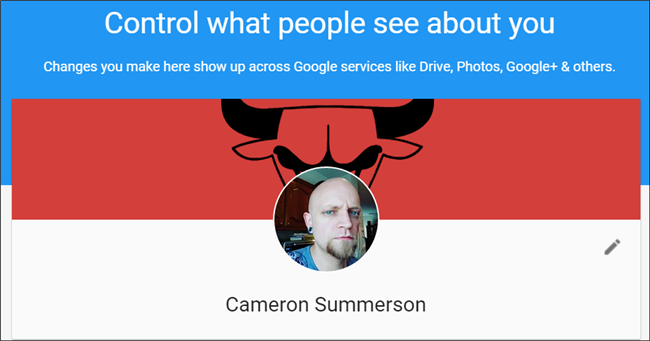 Basically, this is where you can see all your photos—everything from Google+, every tagged photo, everything you’ve uploaded to Google Photos, and the like. It’s the whole shebang. This archive itself is always private since it’s yours, but if you’ve uploaded public photos to G+, the originals are still public. Secondly, there’s a little plus sign in the bottom right corner—this is how you add info. So if you’d like to add your personal contact information (instead of just work), you can do so here. Or if you don’t have all of the above-mentioned categories in this post, this is where you’ll add them if you’d like. And of course, you can set all your privacy info once you’re done. It’s worth keeping in mind that this just applies to your Google Profile and the information shown on it. It won’t change what Google shows about you when someone searches for your name—only the information held by Google itself.